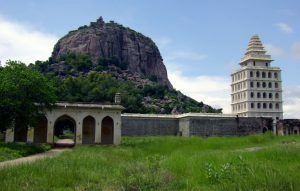 The massive fortification walls of Gingee interconnect the three inaccessible hills-krishnaglri, chakkilidrug and Rajagiri. The three hills are disported in the form of triangle, while the main wall connecting them is 20 meters thick. The tops of the three hills form impregnable citadels, while the inner fort contains many fortifications and gates. The Rajagiri citadel is the highest, about 800 ft. in height, and the most inaccessible. The 20 meters deep chasm is now connected by a bridge. Built in the indo-Islamic style, the kalyana Mahal is one of the most attractive ruins in the fort. 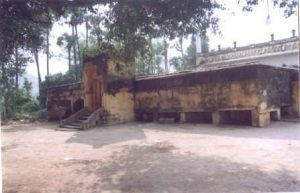 It consists of a square court, surrounded by rooms for the ladies of the Governors household. In the middle of this court, is a 27 meter high square tower, built of stone. The tower has a pyramidal roof. The rooms in this tower are very similar to other Vijayanagar Nayaka buildings elsewhere. Located to the west of the inner gate of the lower citadel, the temple contains a remarkable sculpture depicting Lord krishna playing on the flute with is two consorts. Another interesting feature in this temple is a finely polished, broadsmooth slab found in front of the temple. The way to the Hanuman Temple, outside the lower fort, abounds in temple ponds and many impressive structures. Chakkarakulam and chettikulam are the two famous ponds in this fort.Chettikulam was built by Raja shetty during the Maratha occupation of the place, towards the end of the 18th century. To the north of this pond is a platform believed to be Raja Desingh funeral pyre, where his young wife committed sati. Built in typical Indo-Islamic style, the Audience hall is a damaged roof supported by a series of graceful little pointed arches. The Magazine building is also a noteworthy structure. Built in typical Vijayanagar style, is the famous Rangantha Temple. To the south of the watch-tower, is a big iron cannon, roughly 4 meters long, and 2 meters in circumference. In style and form, this cannon is very similar to the Malik-1-Maidan of Bijapur. This mosque was erected by sad – at – Ullah khah to commemorate his victory over De singh and the capture of the fort in 1713 A. D . it is located at the entrance of the inner fort of Rajagiri. According to a Persian inscription found here, the mosque is said to have been constructed in 1717 –1718 A. D.
An ancient Chola temple. Dedicated to lord Sri Abiramaeshwarar is found here. 1500 years old temple . As the temple seems to have changed many hands Times between. Rajaraja Chola I (AD 985-1012) and Seerangadeva Maharayar. (1584.AD) The Amman Named Muththambigai. 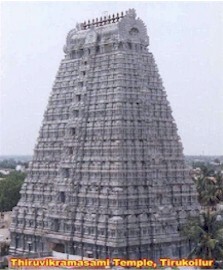 Built by Rajendra Cholan I (1012) lord sri Ramanatha Eswarar. The legend found in Sanskrit language and in grantha character. Written on the periphery of the seal is as follows, Rajad-Rajanya Makuta sreni-ratnesu sasanam Etad Rajendra Cholasya parakesari varmanah.Shrine dedicated to kamalakkani Amman (Goddess Durga), a local deity, is found on the way to the citadel on Rajagiri Hill. It contains a sacrificial altar and well – preserved murul paintings belonging to the Nayak period. It is 2 kms north of Gingee town. The hillock on the western side of the road has two jaina caverns and a huge boulder containing sculptures of all the 24 Theerthankaras 9th Century style. It is only place where all the 24 Theerthankaras are shown in a single large composition. A open rock nearby was the place where monk Chandranandi observed 57 days of fasting and died (5th- 6th century A.D) . Another monk Ilayabhattara observed 30 days of fasting and died in the Century A.D. The pathway leading to the caves at the ground level has an image of Adinatha and at the top of a figure of Mahavira. 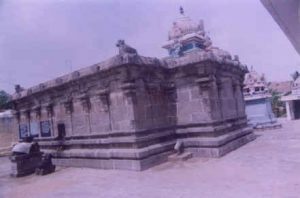 The temple of Angala Parameswari is 32 kms from Gingee, the special deity of the Sembadavars. Here festival occurs in February-March. A special feature of this festival is the Simimasana kollai. The people who attend the festival cook large quantities of grain of various kinds and set them out in the burning ground and offer them to goddess who is brought there. Every Ammavasai (New Moon day) there will be the Lakhs of devotees throng here. situated here. In the inner sanctum there is a snake pit which is being worshipped. There is a congregation of devotees on every new moon day. The temple of Lord Ranganatha, the tutelary god of Raja Desingh is on a hill top. It is a good specimen of south Indian type of rock – cut shrine. The idol of Lord Ranganatha, in a reclining posture, measures 24 ft, in length which together with the inner sanctorum, is carved out of a single rock. It is said to be bigger than that of The idol in Srirangam. This sprawling temple, with its striking sculptures and carved pillars, narrates the aesthetic skills of the Nayaka dynasty. Built by MuthialuNayaka (1540-1550 A. 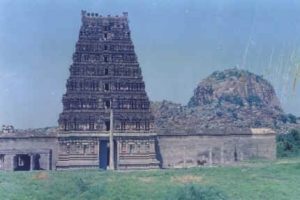 D ) this is the largest temple to GINGEE. The later Vijayanagar period. The temple abounds in gopuras, mandapas and sculptured panels depicting gods and goddesses in scenes from the Hindu epics. Many Tamil inscriptions are also found in the walls of the Mandapas.The temple seems to have faced hard times during the French occupation (after 1761 A .D.) From this period the temple experienced forms of decay and old archaeological wealth was plundered by subsequent invaders. This is a small hill made up of granite boulders, located to the north of Rajagiri on the main road from GINGEE to Tiruvannamalai. The citadel on this hill, can be reached by climbing a flight of steps over a steep slope. Within the citadel are two stone-built granaries, a pillared hall, two temples and an edifice built of brick and mortar known as the Audience Chamber. The 100 year old famous church is situated in Chennai – Selam highway and 8 km from Chinna Salem. 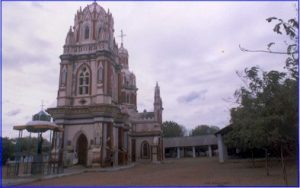 The church is constructed by the Kunchaan, a devotee of St. Anthoniyar. This church is located at Melnaariyappanoor is a village panchayat located near Chinnasalem, in Kallakurichi Taluk of Villupuram District, Tamil Nadu. It is famous for the shrine dedicated to the King of Miracles, Saint Antony of Padua. His feast is celebrated every year on June 13. A famous Archeological Temple site is 20 kms from Viluppuram and 17 kms from Gingee. 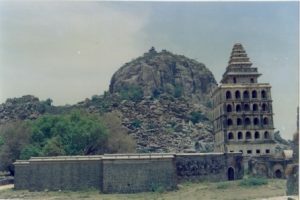 It is a 100 ft hillock, where the Mahendraverma (I) of Pallava kind, (580-630 made a cave temple. It is 20 kms of Thindivanam and 10 kms east of Gingee. Head quarters of Digambara sect in Tamilnadu with the JINAKANCHI MATHA presided over by the Pontiff. Two temples, one dedicated to Parsvanatha and other known as ‘Mailanatha temple was originally a boulder containing roc-cut images of Bahubali, Parsvanatha, Adinatha, Mahavira and Ambika yakshi carved in the 9th century AD. Rebuilt in the 16th century and renovated in the present century. It is 16 kms northwest of Ulundurpet and 21 kms east of Thirukkoilur. Hillock at the village contains a Jaina cave and two temples dedicated to Parsvanatha and Chanraprabha. Cave served as the monastery of the monks of Virasangha in the 8th – 9th century A.D. Rich collection of bronze images found in the temple. Annual festival (Jan-Feb) celebrated on a grand scale and attended by Jains from all over Tamilnadu. An international township. This town of tomorrow now in the making – supported and encouraged by the Government of India, and endorsed by UNESCO – is sited just across the Puducherry border in Tamil Nadu. Representing an experiment in international living, it was launched in 1968 at the behest of the Mother of the Sri Aurobindo Ashram at an inaugural function attended by representatives of 124 nations and all the States of India. This “City of Dawn” is still in its initial stages of development, though the Matrimandir, the central building intended for silent concentration, is now functional, as are many other major facilities, such as its Visitors Centre, Town Hall, etc. 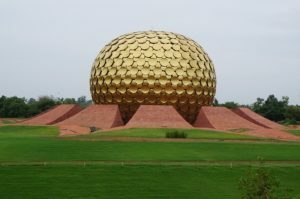 The near-2000 auroville residents from some 40 countries live in 100+ scattered settlements spread around the landscape, either in the city area or surrounding Green Belt. The aim of the project is the achievement of an actual human unity in diversity, while at the same time researching into new approaches to education, health care, alternative energy usage, environmental regeneration, and sustainable living in general. Each inhabitant of Auroville contributes in his or her own way towards building the township. For more detailed information see the Auroville website www.auroville.org. It is situated on the Cuddalore – Chittoor trunk road and 37 kms from Viluppuram. 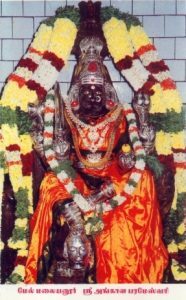 The presiding deities of the Vishnu Temple are Ulagalanda Perumal (Thiruvikrama Swami) and Pushpavallithayar. Kabilar Kundru is also yet another picnic spot at Thirukkoilur which is situated in the middle of the river Pennayar. Kabilar was saint here and his last resting place, is maintained by the state Archaeological Department. It is one part of the Eastern ghats, lies on the western side of the Kallakurichi Taluk. This area spread over an area of 600 sq. kms. approximately with the height ranging from 1000 ft to 3800 ft from the sea level. The History of Kalrayan hills with its Jagirdars run back to the time of Krishna Deverayar the Emperor of ‘Vijaya Nagar Kingdom’. The emperor Krishna Deverayar given the rights to the tribes to enjoy this land but imposed many taxes on them. About the hill tribes it is said that warriors belonging to ‘KARALAR’ community had come from Kanchipuram and settled in kalrayan hills. after sometimes they over ride the tribal people called ‘Vedar’ (hunter) and married their wives. The communities of karalar and vedar who at present are called ‘Malayali’ and they call themselves as ‘Goundars’. Kalrayan hills Possesses innumerable tourism Potentialities like water falls, jungle streams, rivers and rivulets and lovely jungle walks. The place is a veritable paradise for trekkers. It is also called as ‘Poor man’s hill station’ of Tamil Nadu. Every year the District Administration is conducting the Summer Festival to create the awareness among the tribes. Arulmigu Subramaniya Swami Temple located on small hillock at Mailam is a famous place for of pilgrimage. It is about 32 kms from Viluppuram on the Puducherry – Thindivanam road. The Panguni Uthiram festival held in March – April fascinates a large crowd of devotes from all over Tamil Nadu. A Geological park is about 40 kms from Viluppuram and 25 kms from Puducherry. A national geological park with large number of petrified tree trunks known as fossil are found here. There is a temple for Lord Siva constructed by the famous Chola queen Sembiyan Madheviyar. Arulmigu Chandramoulisvarar and Tenambikai are the presiding deities here. Arulmigu Vakkaralingam and Arulmigu Vakkrakali for whom every full moon day and night of the year special prayers are conducted and thronged by pious devotees throughout the night. The Temple was sung by the Thirugnana Sambandar. Excellent sculptures and car/chariot like Mandapam is also existing here with huge Nandhi and Ganesha. It was connected by Thindivanam and Puducherry by regular buses. It is 20 kms from Viluppuram on the Thirukkoilur road which is the birth place of Sadayappar, the patron of Kambar (The greatest Tamil poet and author of the Tamil Epic Kambaramayanam) There is also an ancient temple dedicated to Lord Siva. 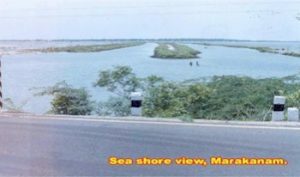 It is 22 kms from Puducherry across East Coast Road in Vanur Taluk. The salt field is very famous in this beach.